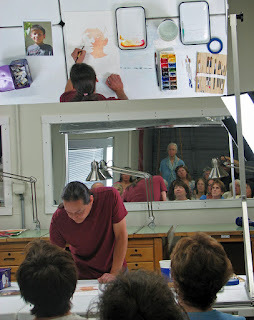 I had a great experience giving a portrait demo at Guy Magallanes' fantastic space today. Met some pretty terrific people who I hope I've inspired to try out portrait painting. In a couple of weeks I'll be teaching the portrait workshop there and cannot wait! This is gonna be fun! It was so great watching you create your magic! Everyone left feeling as they had just experienced your best and left feeling very inspired. A few comments: "best demo I've ever seen" "Incredible work" and "what a nice man"
Wow! that's really kind of everyone, I can't wait to teach the workshop!